Test Patterns: This is really happening. Tuesday: 12:30 – 6pm, Closed Friday. Textures, toys and stories will be on display at the CYCA offices from May to June. 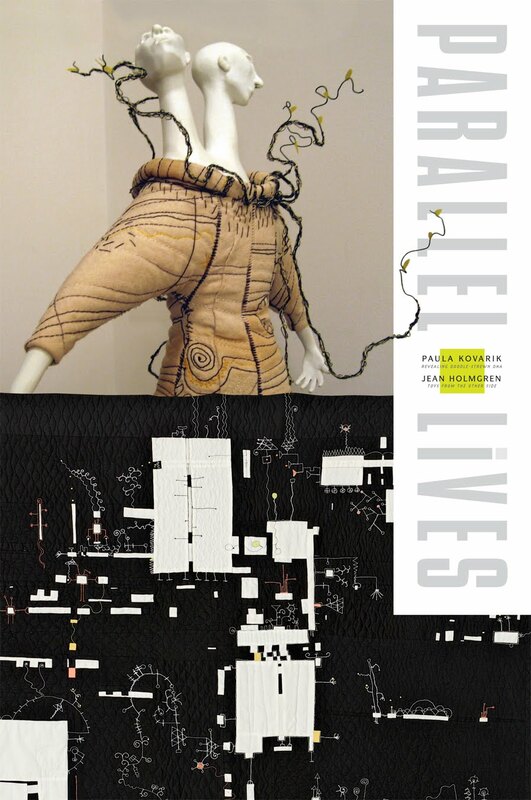 Parallel Lives captures the spirit and sense of two Memphis artists. Jean Holmgren and Paula Kovarik work as graphic designers but find art in odd and different directions. The work includes Toys from the Other Side by Jean Holmgren, art quilts by Paula Kovarik and Conversation Piece, an installation revealing their collaborative process. So, with much humility, fear and trembling and a BIG thanks to our respective spouses, Leigh Ann Dye (our matchmaker muse) and the Craft B'ers for their support- IT IS REALLY HAPPENING and we hope you will come see what all the fuss is about. Marvelous postcard by Paula Kovarik, wearing her everyday Graphic Designer hat. Congratulations! Oh how I wish I could be there. Please take -- and post -- lots of pictures.